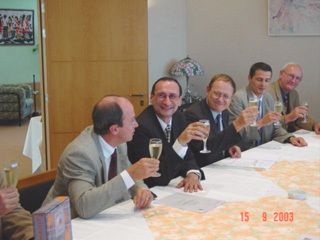 On 15 september 2003 in Brussels, Euro View Services s.a, the industrial informatics service provider of Gilly, signed a partnership contract with Tractebel Engineering for the diffusion of the software Visual Maint TM.During the press conference, Marc Lepièce, Business Development Manager, put the stress on the partnerships of Tracteble Engineering: "We pay attention to the best answers to our industrial customer's needs, in particular for Process control and Maintenance. We will get the better results if we provide the widest range of products and services, in co existence with renowned specialists. That's why we promote high-level partnerships that guarantee products and services that really fit to the markets and let our customers a large freedom in their choices." Antonio Mascia, Chief Executive Officer of Euro View Services s.a., reminded the positive businesses of his company for the last months in planification, organisation, productivity control with several french and belgian companies: "What gave comfidence to Tractebel Engineering in this partnership are the positive businesses lead with some other companies of the Group, such as Elyo and Axima. Thanks to this software, these companies can face the multisector demands of their clients in maintenance management." Martin van Haute, maintenance manager for Fabricom, who took an active part in the selection and improvement of the fonctionalities of the software, said: "We were seeking for 3 years for a C.M.M.S. * that should be cheap, could be set up within a day and that we could consider as our product, that will say that we could recommand on trust to our customers. With Visual MaintTM it's now a dream come true "
Remark : It is MANDATORY to uninstall the previous versions and to save the database. New information ergonomy through sheet tab text colour change on the existing link between different modules. Version management and control making indispensable to update the data of the existing DB before working (cap. in the menu). Display of stock outputs on interventions and Orders. Multi screen management for the positioning of the main window on the screen chosen by the user. Addition of the 7 Days filter in all All-Month-Day filters. New ODBC drivers Office 2000 compatible.